AND NOW – REGENERATION ONE! 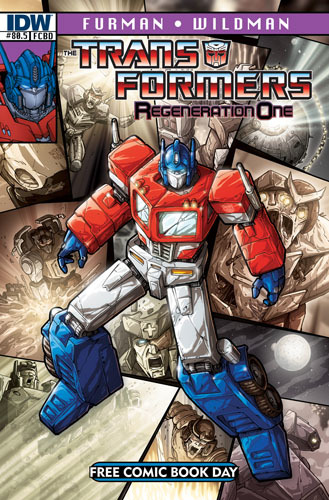 Announced yesterday at Bleeding Cool News, Newsarama and a host of other sites, Free Comic Day 2012 (May 5th) will feature the official launch of Transformers: Regeneration One, the epic continuation/conclusion of the original Transformers comic series, originally published by Marvel (which ended with issue #80 back in 1991). Transformers: Regeneration One #80.5, featuring all-new story (by me) and art by Andrew Wildman and Stephen Baskerville, will be available FREE on May 5th at all good comic book stores, with #81 following in July. So what can you expect from #80.5? Clearly, I don’t want to give away salient plot points at this stage, but I can say… the story picks up 21 years after #80. Cybertron has been at peace (mostly) for all that time, but — of course — there are loose ends. And as those loose ends involve some of the biggest and baddest villains in the (original) Transformers Universe, it’s pretty safe to say that the ‘peace’ will be shattered in a fairly monumental way. The issue will be pretty balanced between stuff to bring readers up to speed and stuff that propels the new storyline onwards, so whether or not you read the original run, you can still easily jump onboard here. What else? Well, when I was doing the prep for the continuation, I re-read all eighty issues, plus mini-series, and made pretty extensive notes about anything and everything that needed attention or some kind of reference or wrap up, so you can expect a really comprehensive and thorough conclusion to the series (though that’s a ways off yet, in issue #100! ), as well as copious nods to what has come before (and not necessarily just in the US comic). What else? Only that Andrew and Stephen are seriously knocking the ball out of the park on the art side. They’re managed that rare trick of recapturing the spirit of the original run but also bringing in another 20 years’ worth of experience to the pages, making each panel worth savouring again and again. Just wait until you see the opening splash and final page of #81. Both are stunning jaw-droppers! Oh yeah, one last thing – categorically, #81-100 are not a lead in to G2. But neither are we exactly ignoring G2 either. Weird as that sounds, I think/hope it’ll kind of work. I’m drawing on everything I can here, and because we know we’re building to a conclusion, you can expect some total bombshells as the issues unfold. Hope that’s whetted your appetite. Keep checking in for more Regeneration tidbits here and on the official IDW website. You are currently browsing the simon furman blog archives for December, 2011.